Glass upstands are becoming increasingly popular in kitchen design. They started out life as a stone, wood or laminate extensions of a worktop. They are typically 10cm (100mm) in height, and in varying thicknesses. The example above shows two types of upstand, laminate and glass. Upstands were created to hide the gap between the end of the worktop and the wall, however this coverage will be dictated by the thickness of the glass you choose. Glass upstands are a cost effective solution to protecting your walls from splashes and dirt. 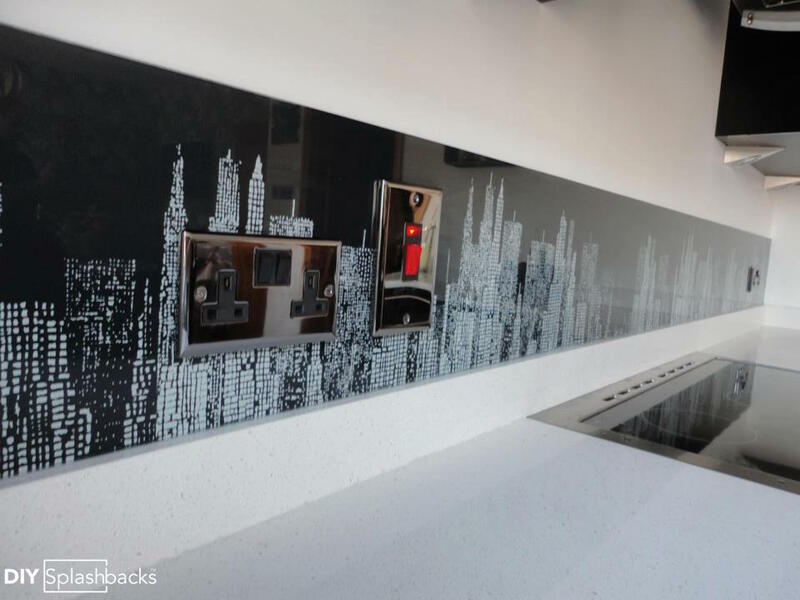 When combined with a glass splashback and our easy-clean protective coating, they are the ideal washable wall covering. 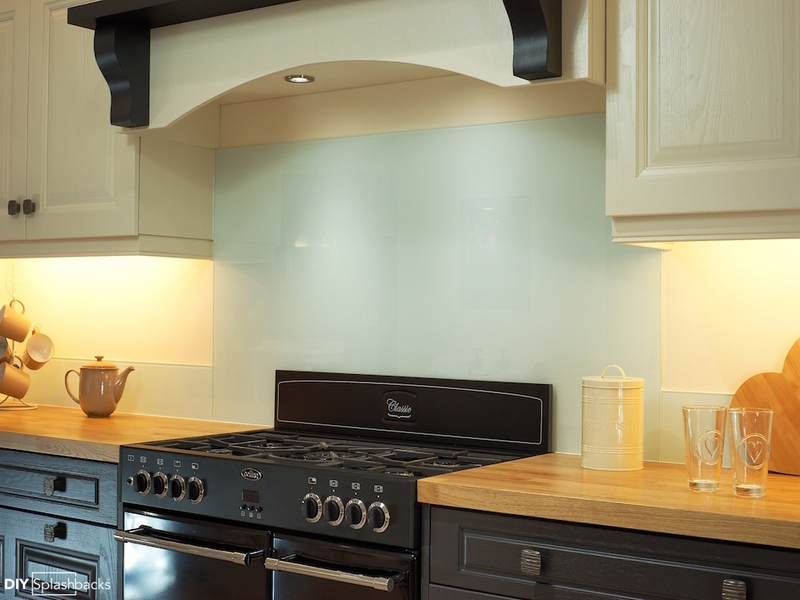 Unlike tiles, glass splashbacks and upstands are almost seam free, avoiding grout lines and nasty sealents. As you can see from the examples above and below, glass upstands are available in any height and width. The above photograph shows how this homeowner was able to measure, and fit entire areas of glass without the need for a professional. With the help of our tutorials section, you could too. We talk you through every stage from measuring to fitting, so you’ll save money on costly tradesmen. Note how each panel of glass runs almost seamlessly from one to another with the finest of joins. The advantage using multiple panels of glass as opposed to tall, long widths is that postage is cheaper, and fitting is easier. Glass upstands are suitable in any style of kitchen, from ultra modern to traditional. 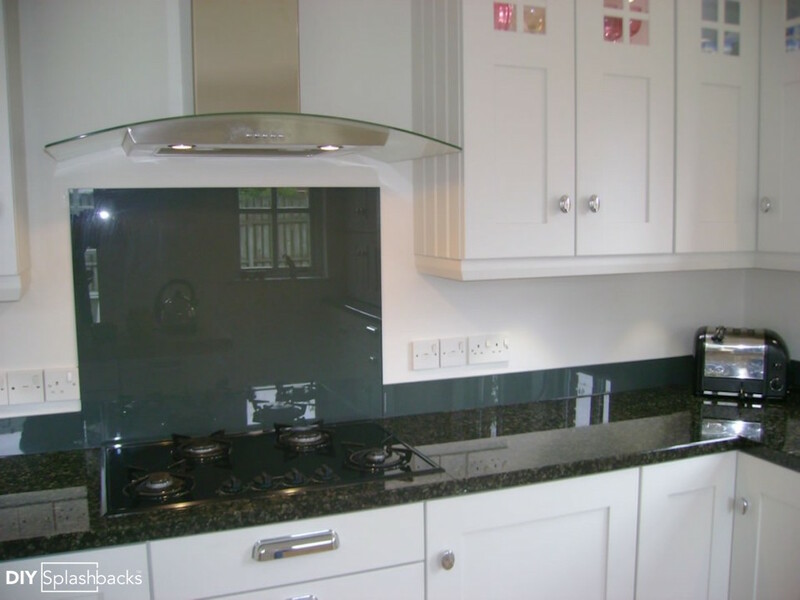 The example above shows a glass splashback and upstands in a traditional shaker style kitchen in our best selling shade Glacier. An advantage of choosing glass upstands is the flexibility to change the paint colour of the walls above. Unlike tiling, glass upstands enable our clients to change their entire colour scheme with a lick of paint, whilst still benefitting from a durable and easy-clean wall covering below. In this example, the client choose a grey shade to compliment their stone worktop for their splashback and upstands. We recommend ordering a glass sample to help find a colour match, or alternatively- why not send us a sample of your worktop and we can recommend the perfect shade? We’re always on hand to provide advice and inspiration. 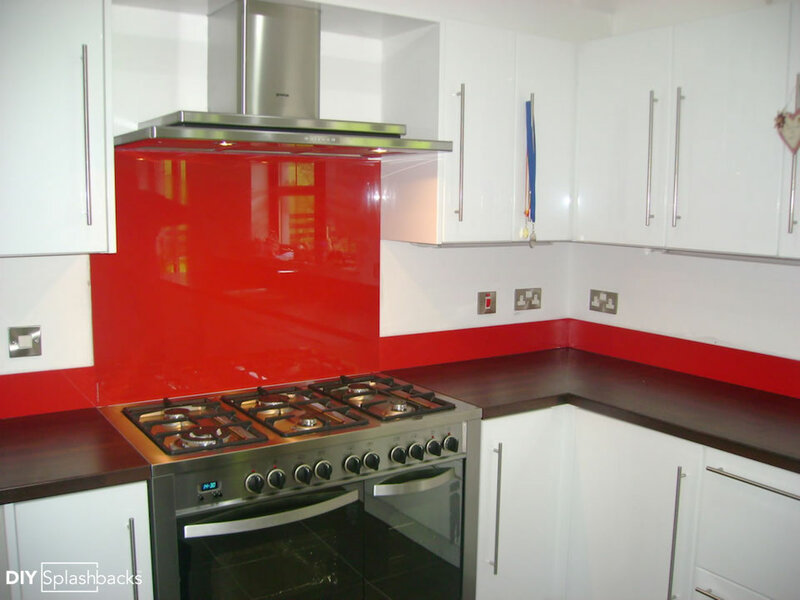 Call us on freephone 0808 2540007 or email us on enquiries@diysplashbacks.co.uk for help. 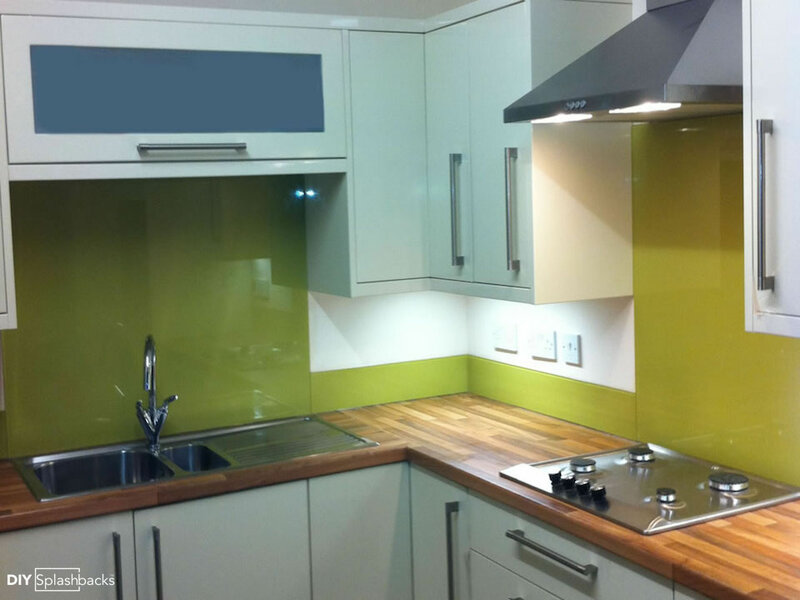 As with glass splashbacks, glass upstands are available in any colour. We colour match with any large branded paint range, it’s even possible to send us an item to colour match. 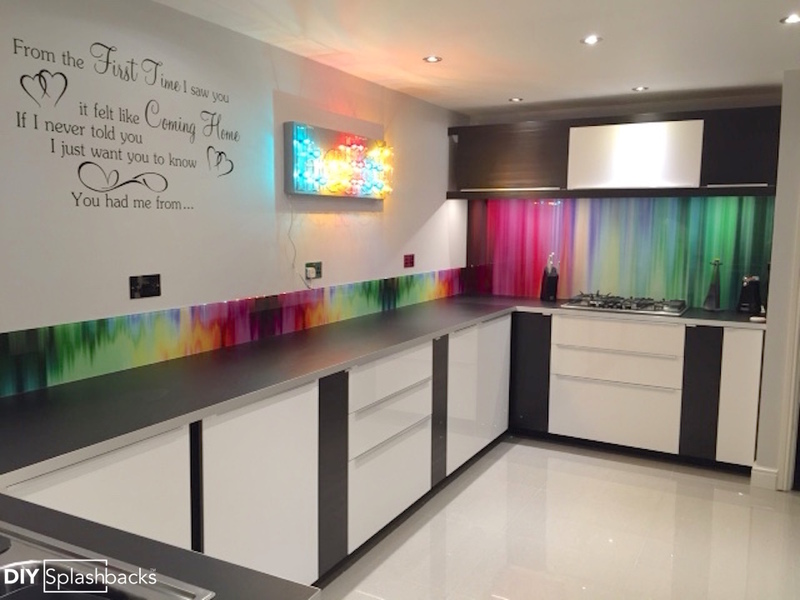 We’ll post your item back with your completed splashback. You’ll find a large selection of colours on our easy-quote tool, if you can’t find the shade you are looking for simply get in touch. Remember it is possible to order a glass sample in your chosen colour. Glass samples are particularly useful, as they are upstand sized! A sample is 100mm x 100mm (a typical upstand is 100mm high) and is refundable if you place a splashback order. Glass upstands don’t have to be a plain colour! Our extensive range of printed designs are also available as upstands. The example above shows our Spectrum Rays Design continued along the length of this clients kitchen. Our design team can work with you to ensure your design choice is compatable, and even send proofs of how this would look in your dimensions. Get in touch to find out more.